Hidden in the remote northeastern corner of Oregon is a land of Alps unlike anywhere else in Oregon. Here you ascend deep u-shaped canyons for 10-20 miles to reach the inner glacial sanctums of bare rock and crystalline lakes. Your neck aches from gazing so steeply upward at the 9,000+ peaks on either side, ears full of the sounds of swift streams and distant waterfalls crashing down the steep granite slopes of hanging valleys high above. The canyon vegetation alternates pleasingly between a varied forest of pines and true firs, and numerous resplendent meadows where the scent of wild onion crushes underfoot. Outdoors writers like Mark Bagett report that this region of Oregon supports a population of the rare and exciting Wolverine, the ferocious "carcajou" of the Canadian Northwest Territories. And in recent years, you may hear the sound of the wolf pack that was introduced! 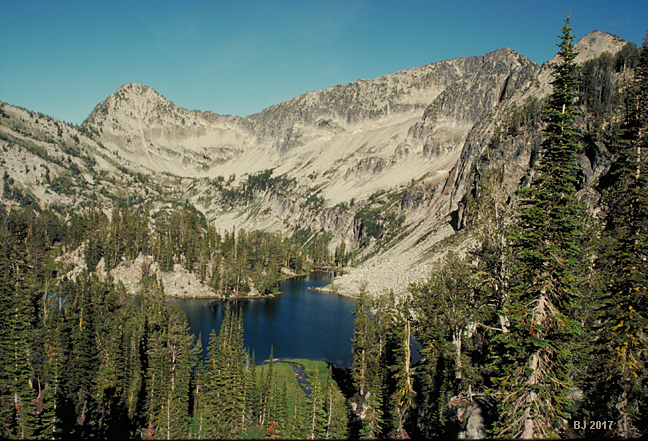 Pictured above is Pop Lake, 7566' in the upper reaches of the Minam River drainage. It's reached only via a faint, nearly abandoned trail over a 8050' pass. The perfect lake nestles in hidden glory in its hanging valley high above the Minam, with 9000 ft. Needle Point to its east. The Eagle Cap Wildeness preserves the central portion of the Wallowa Mountains. It was established as one of the first Oregon Primitive Areas in 1930, and formally designated as one of Oregon's earliest Wilderness Areas on 10/7/1940, at a size of 293,775 acres, since expanded to 355,000 acres (Oregon's largest Wilderness). Just to the east on the Idaho border lies the magnificent Hells Canyon Wilderness, established 12/31/1975, a medium-sized Oregon wilderness area at 108,900 acres (the Idaho portion of the Wilderness adds another 83,800 acres). For a map of all 40 of Oregon's wilderness areas, please click this link: http://www.wilderness.net/index.cfm?fuse=NWPS&sec=stateView&state=or&map=orwest.... Pictured below is a scan of a historic postcard advertising the Wallowas. I've since lost the card, but estimate this image is at least 20 or 30 years old. It pictures the classic "tourist" view of the Wallowas that helped to establish them as "Oregon's Switzerland." This is the most-easily visited major viewpoint; it's located at Wallowa Lake State Park, near the Mt. Howard tramway. The picture is taken from the giant terminal moraine left by the glacier which carved out Wallowa Lake! (below) Cached Lake, 7,300 ft., Eagle Creek drainage (you must hike many miles to get to this lake!). It is one of approximately 60 alpine lakes in the Wilderness. A quality of the Wallowas so unlike the Cascades is the brillance of the light that bathes them; their large expanses of gem-like, crystallized metamorphic rocks catch and throw the high altitude sunlight in an arresting manner similar to the High Sierras, John Muir's "Range of Light." The many creeks and rushing rivers of the Wallowas are surprising since the surrounding lowlands are so semi-arid. 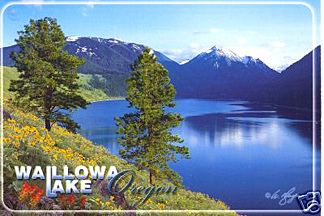 and links to Oregon's highest lakes!